Everything you need to grow your church. At ForHim we have found our purpose—to help churches reach more™ and grow His kingdom with creative, print and digital solutions. Reach More™ with powerful advertising strategies that help the church grow! We specialize in both Targeted Direct Mail and the Every Door Direct Mail® (EDDM®). Reach People. Everywhere! We help grow churches of any size or budget with easy, affordable & highly effective online display advertising. Powered by AdChirp. Our full service in-house graphic design team has a passion for launching, revitalizing and accelerating church brands. Powered by Fireleaf, our award winning creative agency. At our company's core we have a heart for helping churches and ministries reach more and grow. 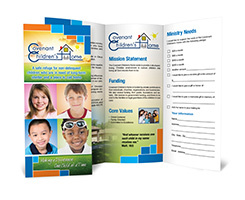 Our team is ready to help you with all of your church design, printing and marketing needs. Reach People in Your Neighborhood. Enter your targeted zip code below and use our map tool to find the exact routes you would like to mail to. With several exclusive filtering options like drive time, radius and even up-to-date demographic data, you're sure to reach more. If you would like to target a specific list of people, you've come to the right place. You can easily build and purchase your targeted direct mail campaign online and start reaching people with high quality, full color direct mail postcards.